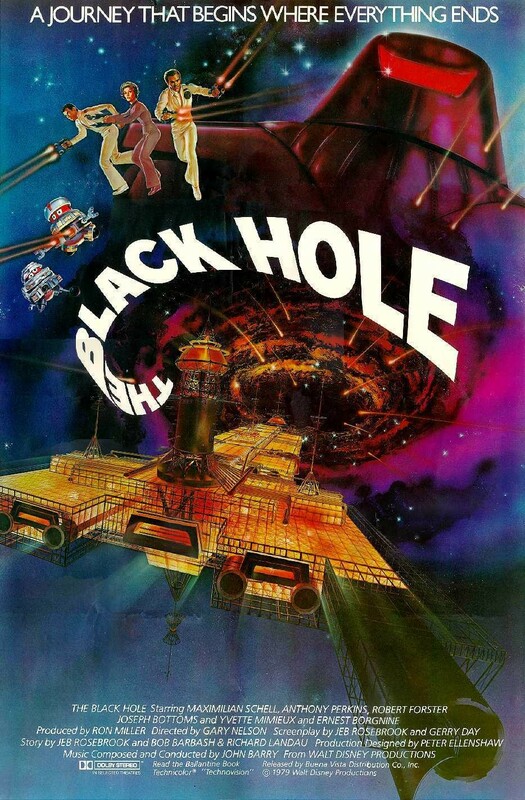 Throwback Thursday: Whatever Happened to Disney’s The Black Hole? Throwback Thursday examines films from the past—“classic” films that might not be in the current cultural zeitgeist but can still be important, fun, and relevant. Walt Disney Pictures released 47 films in the 1970s. Only one of those, however, was rated PG. What could have possibly gotten Disney away from their standard G fare and actually gotten a PG rating? If you read the title of this column, you’ll already know that it was 1979’s The Black Hole. Disney, at the time, was trying to diversify its films and start aiming at an older audience (a goal that would eventually lead to the formation of Touchstone and Hollywood Pictures to specifically focus on adults). The Black Hole wasn’t a huge success on its release, but it definitely wasn’t a failure—it made its budget back and then some. So why is this sci-fi film relegated to cult status? The basic plot of this film details the crew of the USS Palomino returning home to Earth after exploring deep space for inhabitable planets. They encounter a black hole and find that another spacecraft is somehow tethered in the hole’s gravity well; discovering that it is a previously lost Earth vessel, Cygnus, they decide to board and explore. Cygnus is commanded by the brilliant but possibly mad scientist Dr. Hans Reinhardt (Oscar winner Maximilian Schell chewing scenery wonderfully), who has been studying the black hole for the last 20 years and plans to fly into it. Of course, the Palomino crew, led by the no-nonsense Captain Dan Holland (Robert Forster, who went into ’80s B-movie land because of this film), decide that they need to get out of there before that happens. Reinhardt is bad because he’s dressed all in red. So what makes this an “adult” Disney? Well, there are a couple “damns” and a “hell,” but otherwise the language is pretty tame. What I think does it is the sinister foreboding that director Gary Nelson brings to it. Nelson only directed five feature films, another being Alan Quatermain and the Lost City of Gold, but there’s definitely a throwback feel to The Black Hole. It feels like a darker version of The Forbidden Planet. 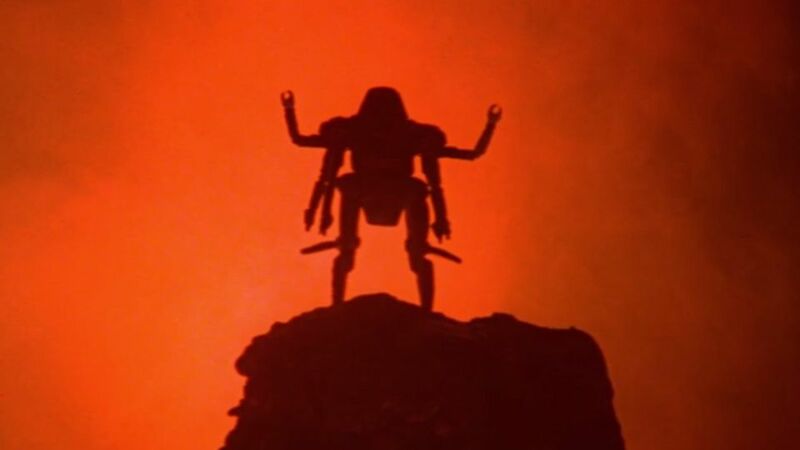 Whereas Forbidden Planet brought us the menacing but actually lovable Robby the Robot, this film gives us the incredibly evil killer robot Maximillian. To balance the dark side of robotics, we are also given the helpful robot VINCENT (voiced by Roddy McDowall) and the tragicomedic robot BOB (voice by Slim Pickens). And yes, having Slim Pickens voice a robot is just as odd as it probably sounds in your head. Maximillian. And yes—those are spinning blades on his arms. As a child, Maximillian scared and enthralled me at the same time. This film is really all about the robots and special effects—besides the main ones, there are a host of guardbots that are there to be threatening, but then also to be cannon fodder once the heroes decide to fight back. Of course, with this film being created before the advent of CGI, you can still see the wires holding the actors up when they are in zero gravity, but I think that gives the film a certain charm. Plus, you get to see Ernest Borgnine and Anthony Perkins do cartwheels in the air, which is even more charming. And even though there might be wires, some of the matte paintings for the backgrounds are gorgeous. The Black Hole also brought some new special-effects tricks to the table and allowed the camera to move over a matte painting, which provided more flexibility when adding actors into it. There is a great moment toward the end of the film when a meteor shower is raining down on the Cygnus and we see a giant flaming meteor tear through the center of the ship, almost mowing down our heroes. An incredible visual shot. There is a loose interpretation of Dante’s Inferno present in the script and imagery, referenced explicitly toward the start of the film by a couple of characters and then driven home with the ending. Is Reinhardt supposed to be Dante? Does the end of the film show him having to pay for his sins while an angel escorts the remaining heroes out of hell? There’s a lot of interpretation that can come from the ending. While not a perfect film (don’t get hung up on the gravity, or the science in general), I can still recommend it for the fun character actors, the art direction and special effects (minus the wires), and the very well-done ending. Plus, Maximillian is a cool robot that still unnerves me to this day. What does it all mean? And is Dave Bowman there? This film can be found on DVD only and is currently not available via Netflix rental—it’s like Disney is trying to hide it from us. Feel free to discuss further in the comments below; just keep it respectful. Never saw the movie, had the read along record/storybook. I loved those record/storybook collections. I had so many of them growing up. It actually helped me learn to read and love books so much.